AFC Energy (AIM:AFC), the industrial fuel cell power company, has announced the successful deployment of CH2ARGETM, the world’s first electric vehicle charger based on hydrogen fuel-cell technology. The breakthrough by the UK-based energy technology company could enable 100% clean electricity for future EV charging. 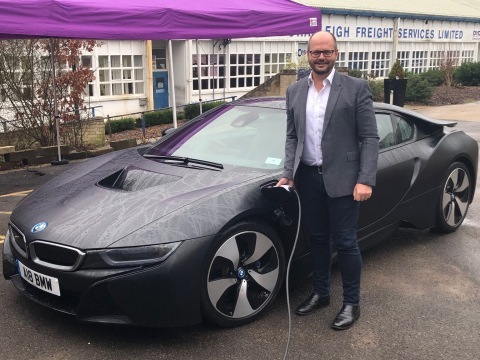 The demonstration of AFC Energy’s CH2ARGE system took place at Dunsfold Aerodrome, home to the BBC Top Gear test track, and saw a BMW i8 as the first ever car to be recharged with power generated by a hydrogen fuel cell. The innovation takes place after 10 years of fuel cell research development at the AFC Energy laboratories. The EV market is set to grow rapidly and the UK government has stated that 50% of new car sales will be EVs by 2030 which will see nine million EVs on the road. By 2040, 100% of new car sales are planned to be EVs leading to the entirety of the UK’s fleet of 36 million cars becoming EVs. To recharge the fleet of EVs, the UK National Grid estimates show this will require generation to be increased by 8GW, while calculations by AFC Energy show that if one in 10 of the EVs is being recharged simultaneously the UK’s future fleet of 36 million cars would have a peak demand surge of 25.7 GW based on an average EV battery of 57 kWh. This maximum peak demand equates to approximately half the UK current generational requirement and is the equivalent of 7.9 new nuclear power stations or 17,100 wind turbines. Popular venues such as sports centres, stadiums and supermarkets will also have to scale up EV recharging solutions; a scenario where 25% of vehicles are EVs and half plug in to charge while at the venue would require 11.5MW of electricity generation. Extensive investment in new power stations and upgrade of the distribution network would be required unless these demands are met through localised power generation. CH2ARGE includes AFC Energy’s small-scale fuel cell connected to an inverter similar to those used by other major automotive companies at their Electric Vehicle research centres. The inverter transfers energy created by the fuel cell to a charger. The system is supported by a 48V battery pack to assist with peak power demands. The solution can also be tailored for both on and off grid applications and scale up as required. The demonstration CH2ARGE system was sized to provide sufficient power to charge two EVs concurrently at recharging levels 1,2 or 3. The system’s inverters are controlled via AFC Energy’s fuel cell control system which ensures the safe and precise control of the complete setup. Being integrated into AFC Energy’s control system means that product solutions can be implemented with Smart Charging capabilities.